Carbrooke Mill Lane postmill was replaced by a towermill that was built built for Richard Dewing J.P., D.L. of Carbrooke Hall in 1856. The mill had roundhouse and in 1839 had 2 patent sails that drove 2 pairs of stones, a flour mill and jumper. A Desirable ESTATE comprising a compact WINDMILL in full trade, with two pair of stones, flour mill, going gears etc. complete, together with about 2 acres of arable land; also a cottage & necessary outbuildings, situate at Carbrooke in Norfolk, a good corn country & within two miles of the market town of Watton & about five miles from Hingham & Shipdham & now in the occupation of Mr. John Dearsley who will give possession at Michaelmas next. Apply to Mr. John Ringer at Honingham, Benjamin Wilkinson, Flordon, W. Parson, the Auctioneer or Mr. John Dearsley who will shew the premises. WILLS proved in the Consistory Court of Norwich. Proved at Hingham, 10 October 1814. All that substantially built brick & tiled MESSUAGE with the Barn, Stable, Outhouses & Land thereto adjoining, containing altogether 1a. 2r. 9p. together with a capital POST WINDMILL, Driving two pairs of Stones, with Flour Mill, Jumper & all requisite Machinery in excellent condition, standing on the said Premises, the whole eligibly situate at Carbrooke in the said county, within a short distance of the Market Town of Watton aforesaid & now in the occupation of Mr. M. Hardy, the Proprietor. The Messuage & Outbuildings, Windmill & 2r. 9p. of Land are Freehold & the residue Copyhold of the Manor of Carbrooke late of the Hospital of Saint John. Apply to Mr. W. Drake, Solr. East Dereham. A Capital POST WINDMILL with two Patent Sails & two pair of French Stones abreast & Flour House & Baking Office, all in excellent repair, situate in Carbrooke near the Turnpike road there, with a substantial dwelling house, a new erected lead pump & requisite outbuildings all in good repair, with a good Garden well planted with choice fruit trees & about 2 acres of excellent land adjoining, part Copyhold, fine certain, the rest freehold & now in the occupation of Mr. Edmund Land the Proprietor. Apply to Mr. Edmund Land, Mr. John Land, Watton Green, Mr. Grigson, Watton or the Auctioneer. Post Windmill, Garden & Land at Carbrooke etc. Lot 3. A Post Windmill with roundhouse, 2 patent sails, drives two pairs of stones, flour mill etc. Dwelling house & garden well planted & a piece of Arable Land containing altogether 2 acres situated near the Watton & Hingham turnpike road, in the occupation of Mr. Edmund Land. A Post Wind Mill with roundhouse, 2 patent sails, drives 2 pairs of stones, flour mill etc. 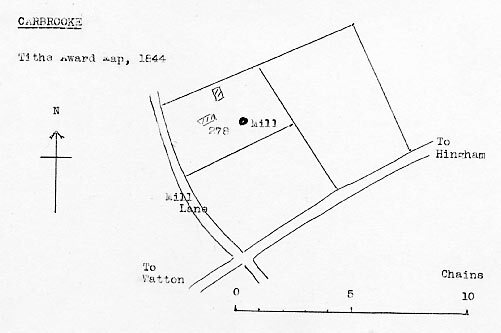 Dwelling house & outbuildings, a garden well planted & a piece of Arable Land containing altogether about 2 acres, situate near the Watton & Hingham Turnpike Road, in the occupation of Mr. Edmund Land. The Messuage, Outbuildings, Windmill & 0a.2r.9p. of Land are Freehold & the residue Copyhold of the Manor of Carbrooke late of the Hospital of St. John. Fine certain. Rent charge payable to the Vicar of Carbrooke 4s.